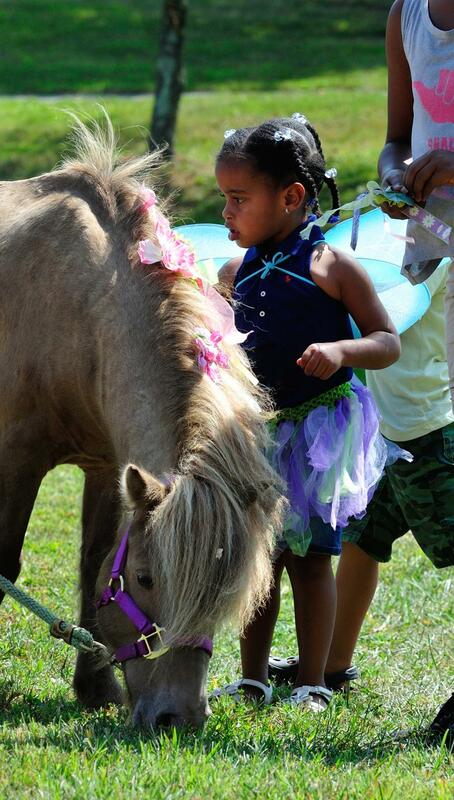 Our pony parties are beyond fun - no matter what your venue. Whether you are a master planner or just called us two days ago, do your homework here and you'll be surprised and delighted. Here is an outline of how things work some typical parties. 1:50 mini horse feeding orientation, then mini horse feeding. Group photo op with ponies. 2:00 We begin packing up while you sing 'Happy Birthday' and serve cake. 2:15 The ponies can have a goodbye piece of cake right before they load, usually . 2:20 Services end, mini horse feeding orientation, then mini horse feeding. Group photo op with ponies. 2:30 We begin packing up while you sing 'Happy Birthday' and serve cake. Please have final payment ready (cash) as we do several parties per day. Fees apply for delay in payment, $50 per 15 minutes. 2:45 The ponies are expecting a goodbye piece of cake right before they load. *note that we expect to begin setup upon arrival. Unless otherwise discussed in advance, changes to contract (non-standard parking, parking space not reserved, portage etc) may decrease the length of time we have to provide services. Portage fees, if possible, starts at $50. 12:30-40 Arrival. We come early to set up and allow for time to move cars, tweak the location etc. We do not make site visits before the party date, and may ask you for photos with multiple views, sketches, and video if you wish to plan in advance. If there is time and things go smoothly and you prefer it (i.e. you have the type child who may melt down at the end of the party)- we can set up some photos for the birthday child and the family before things get started but normally we do this at the end. 1:00 Orientation and Safety Rules Q & A. We anticipate that not every guest may be here, so our floater staff will circulate with cards printed with our rules and regs, and will brief your latecomers with a smile. 1:05 Mini horse decorating, pony rides, and face painting begins. For this size crowd we generally supply two riding ponies. Only one will be a unicorn if you wish to also have balloon twisting, which is performed by the second pony walker, as the unicorn cannot be tied and left. 2:00 If all the children have tired of riding, we can tie both riding ponies and do glitter tattoos. 2:45 Ponies are unsaddled and all the children are gathered and put into two lines for the mini horse feeding. 3:00 Party is officially over, and we break down while you do cake. We accept final payment (cash) at this time. 3:15 The ponies and mini horses are eagerly awaiting their sweet treat. Lilly prefers 'real' cake with butter based icing - not a requirement unless your Birthday child would be upset if her treat is rejected. The other ponies are vacuum cleaners, and will eat whatever it is. 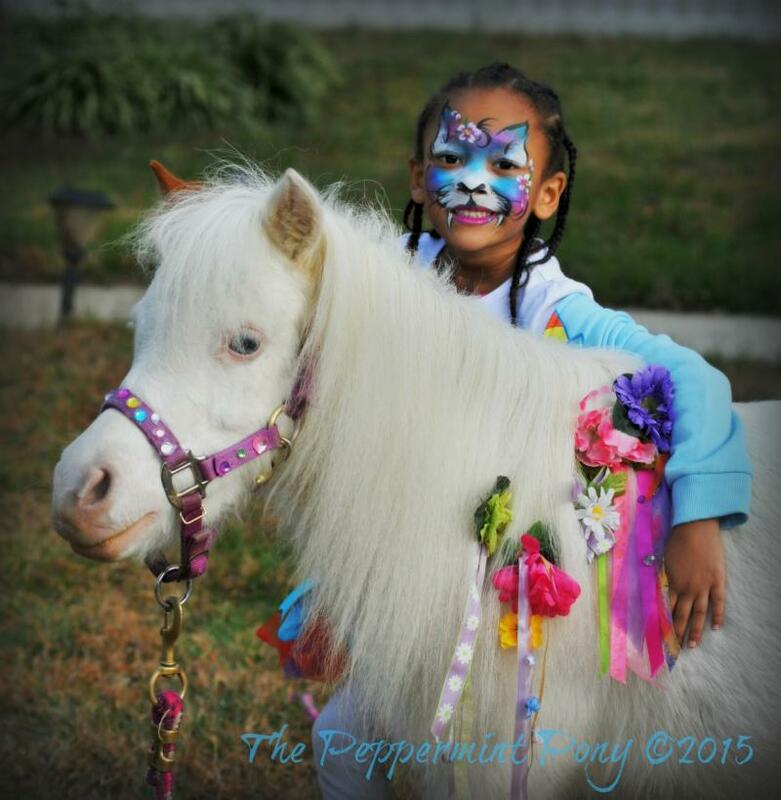 A Peppermint Pony Party is no ordinary pony ride party. It is a totally fantastical interactive equine experience. 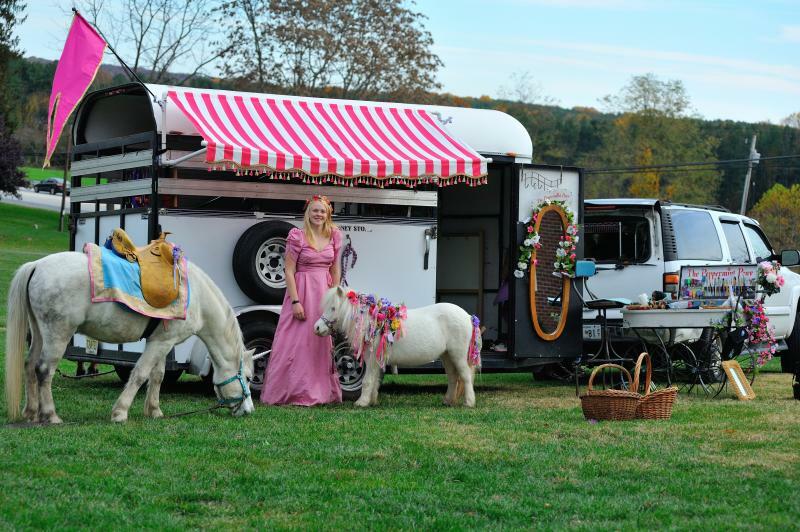 The party begins when the mini horse comes off the trailer - send the kids on down! To avoid the hazards of unsupervised children, we arrive right at or at most just a few minutes before the our start time for our standard parties. Don't worry - our setup takes less than five minutes to get started - less if the riding pony arrives saddled. We work off our trailer and the mini horses generally stay tied to the trailer. Some shade for rides and setup is a necessity in the summer months. The face painting is always set up close to the rig as well (as pictured above). This allows Miss Angela to keep an eye on everything and grab all those precious photos. We ask that you have parking blocked off in advance, as it is easy to eat up fifteen minutes of your party time in the process of moving cars. Do not count on using your driveway - we will be using the road in front of your house for parking. Parallel parking can be impossible depending on the width of the street if cars are parked on both sides. Please allow plenty of space for us to pull in, and straighten out. We have a 6' door on the back of the trailer we need to open to unload. **if your party is not on a through street, we must be able to execute a three point turn, or turn around in a circle to leave your party. We do not back up to exit. We have a big back yard, why can't we use it? Parties work best when staged in the front yard, off of the horse trailer. We require that you keep active ball and swingset away from the ponies. Nobody wants to be scolding kids for being kids during a party! To keep prices down, we need to set up and break down quickly. Our business model requires us do multiple parties per day. (Unless you are booking us for the day, i.e. Supreme parties). Our sound equipment is stationary in the horse trailer. Miss Angela needs to be in sight of the ponies while face painting, and the ponies need to be in sight of each other. We recommend that you consider having some setups in the front - a table, some drinks and snacks, and perhaps a few chairs. If you are having a "Pony Ride Only" party, in some circumstances we can port brushes, mounting block etc to the back yard, if we find it large enough to give rides in without children needing to cross the path of the riding pony, and appropriate footing for the riding pony. Avoid hurt feelings - read the party rules in advance. Call or write if you need clarification. We have index card-sized inserts we will be happy for you to send with your invitations - just ask us and we can mail or email them to you. We will take a few minutes to go over the party rules at the party start. All parents, responsible adults, and participating children MUST attend. Please direct all latecoming guest to this sign, in case we are unable to do so as services have started. All active play must be restricted to the back yard or house. This includes play equipment, balls, swords, guns, water play, ride-in toys, noise makers. If you purchase Western hats, please make sure they have chin straps if the children are to ride in them. Time to Decorate those Minis!! I spend an insane amount of time, money and energy crafting THE most beautiful ribbons you'll ever see, for the girls and boys to pin onto the mane and tail of the mini horses. Our Miniature Horses, Easter Lily and Pocohantas, are very tolerant and gentle. The kids can start grooming and decorating the mini as soon as we get her off of the trailer.﻿﻿ We bring the brushes and the ribbon clips. Our ponies are curious and friendly by nature. We can make your party as educational as you like, just let us know in advance. Please help us keep the under-four year olds away from the riding pony/ies, and redirect them to the mini horses for their safety. If you have a guest (of any age) who will resist redirection or who does not understand English, please assign them a chaperone/translator in advance for the duration of the party. This is non-negotiable. We can provide one at an extra charge, just mention in the comments section of your quote request. BOWS AND RIBBONS ON THE MANE AND TAIL ONLY, PLEASE! Our ribbons and bows are beautiful but STABBY. 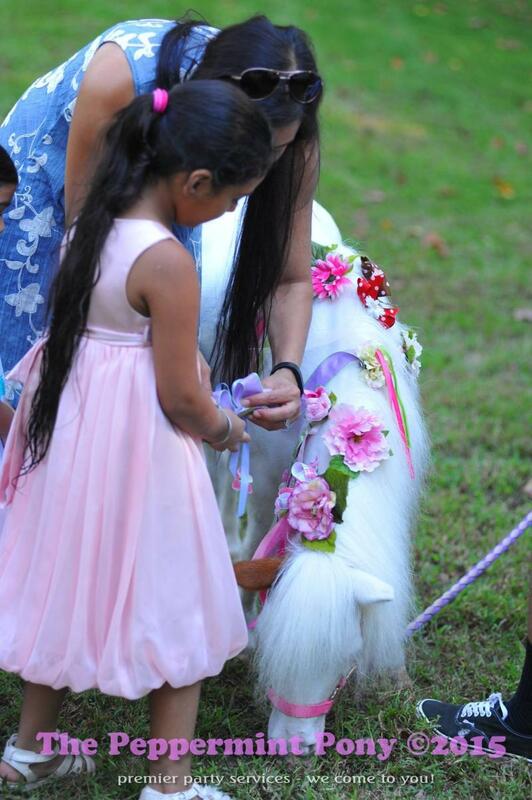 At Pony Lover's Package parties - parents and hosts are in charge of the mini horse's welfare. Please choose a Supreme package if this makes you uncomfortable. 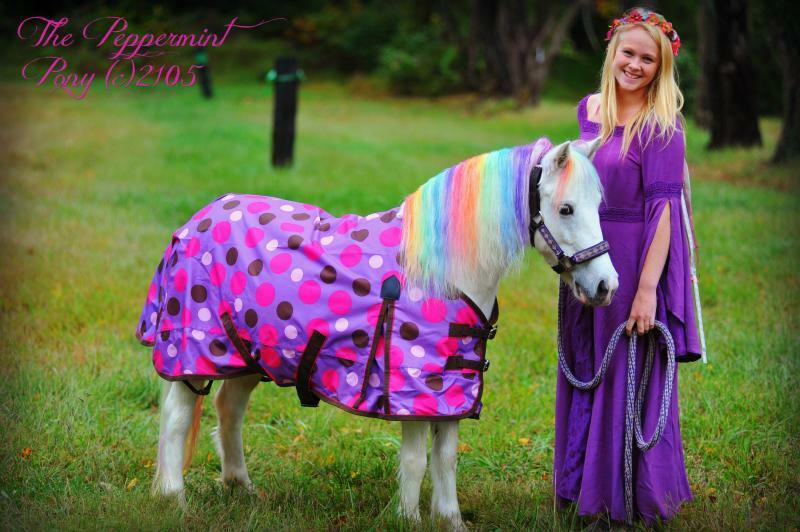 To keep your costs down, we do not bring extra attendants for the mini horses except for Supreme parties. Please encourage your guests to assist their children in learning party manners by helping them keep the ribbons and brushes off the ground. Nothing is sadder than a small child casting around, calling for their mom or dad to help them onto the pony and the parents being nowhere in earshot. Share this with your child. Memories last a lifetime. We ask that parents or other adults at the party assist children to mount as necessary. Smaller children can be lifted and *GENTLY* placed on the pony's back. We appreciate your cooperation. It is very very important that the children listen to our handler's instructions and sit quietly and upright during their ride. Chiropractors are expensive! Our handlers will be on the left of the pony with their hand on or in grabbing range of your child. An adult may walk along on the right side for emotional support, but for the pony's well-being we ask that the child's center of gravity remain right over the center of the pony - so no leaning. NEVER let a ride provider strap your child to a 500lb animal! Our riding ponies require respect. To avoid confusion with their future horsey encounters - we instruct your guests to treat the riding ponies as you would a full-size horse. This means no following, no bumping, no running around and no hand feeding. The riding pony receives his treats on the ground, typically the stubs of the carrots after mini horse feeding. If you are having a Unicorn party, extra care must be taken to ensure the children do not mob the Unicorn from the front and endanger themselves. This means having crowd control in place *before* our arrival, to avoid hurt feelings. Our parties are paced to allow plenty of time for photo opportunities. Let us help you find the perfect spot and set the pony up for the best lighting and expression. 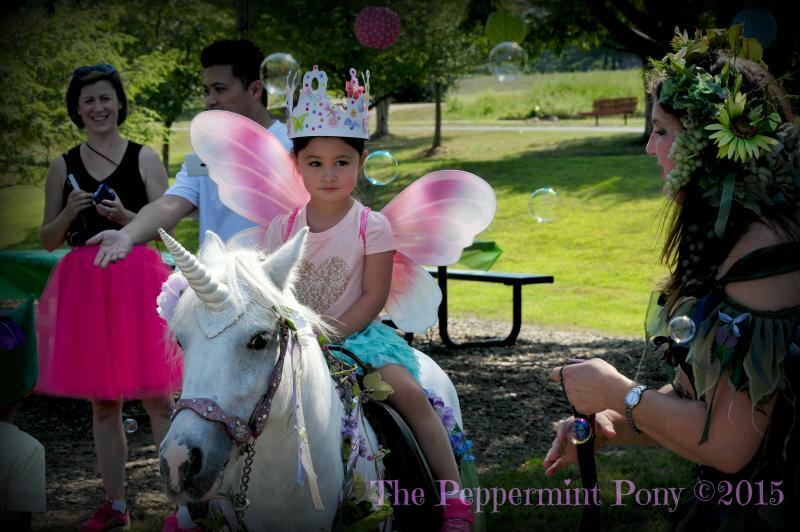 A pretty young faerie or princess to lead your extra special party is a crowning touch. 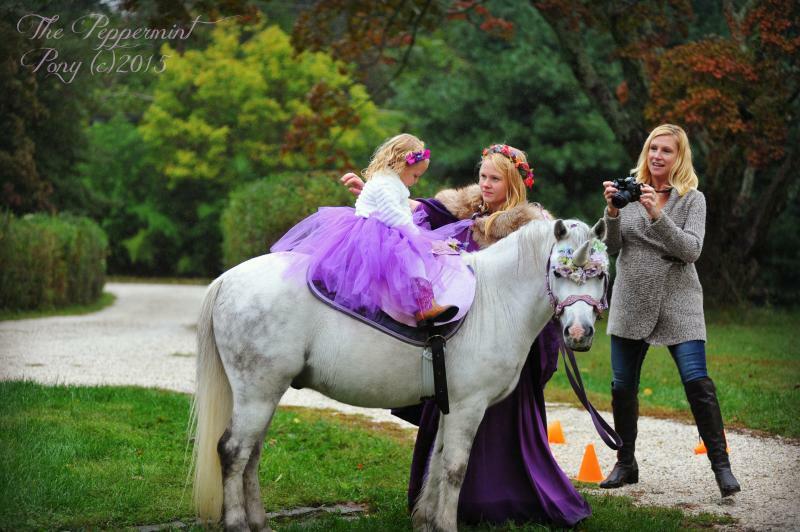 All of our faeries and princesses are beautiful, poised and knowledgeable about ponies and riding. 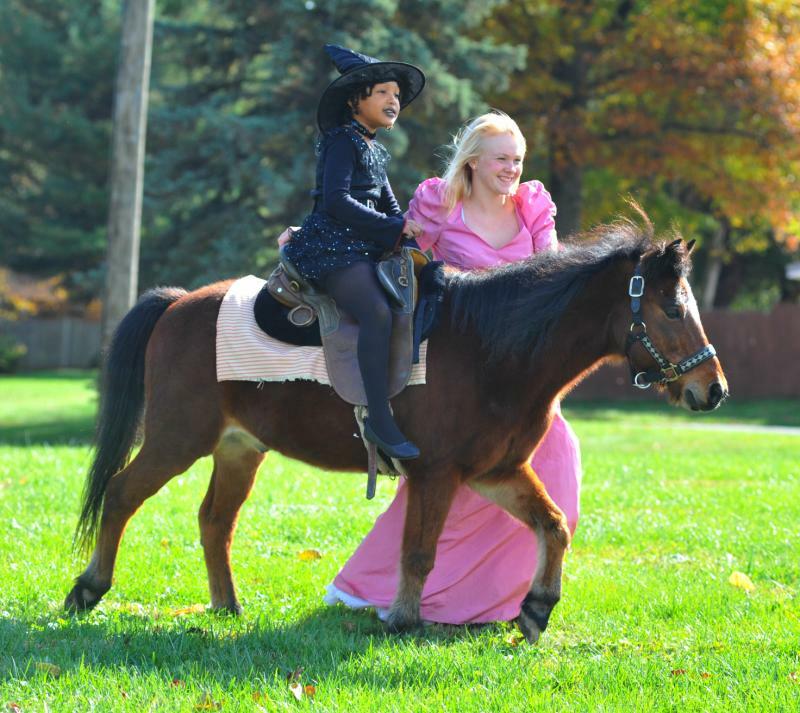 All of our pony handlers come attractively costumed or dressed, including smiles. Please do not attempt to override their decisions on safety/weight limit/riding schedule, or the Fairy Godmother will intervene. 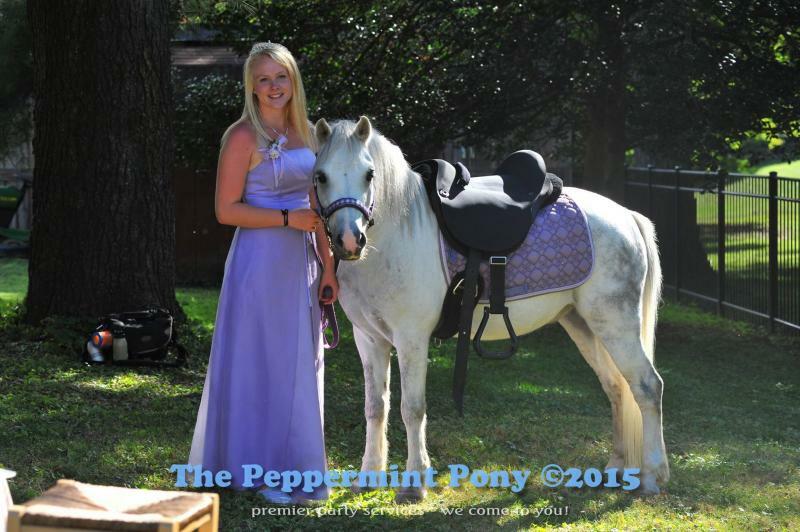 The standard "we come to you" party will have one riding pony and one mini horse. The mini can continue to be decorated with ribbons and flowers while the other children are riding. 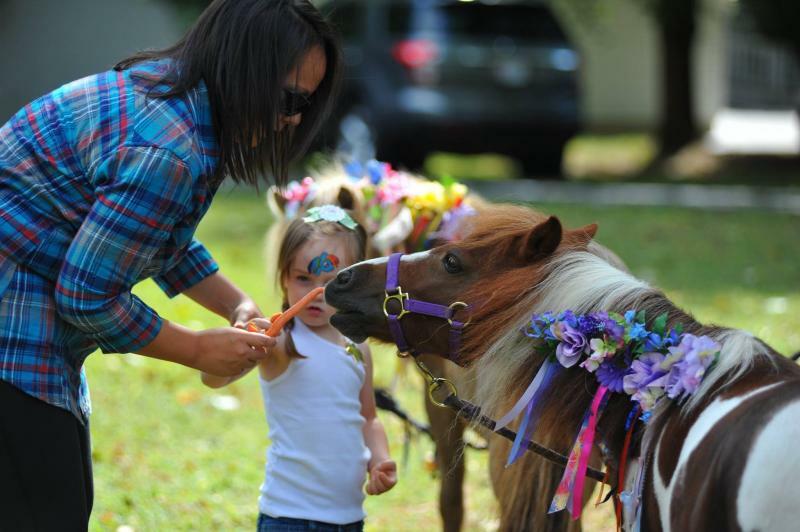 If the guest of honor doesn't want to miss the rush of decorating the minis, don't worry - The party timeline includes time at the beginning and end of the party to decorate, then feed the mini horses. Let us know if you are hiring a professional photographer so we can brief them on the best shots and angles. We will be taking photos for our own use, and offer the option of downloads for purchase. Please let us know in advance if you do not want photos taken or posted (we never post children's names and our camera GPS is turned off). Currently we use a Nikon D700 camera with pro lenses. 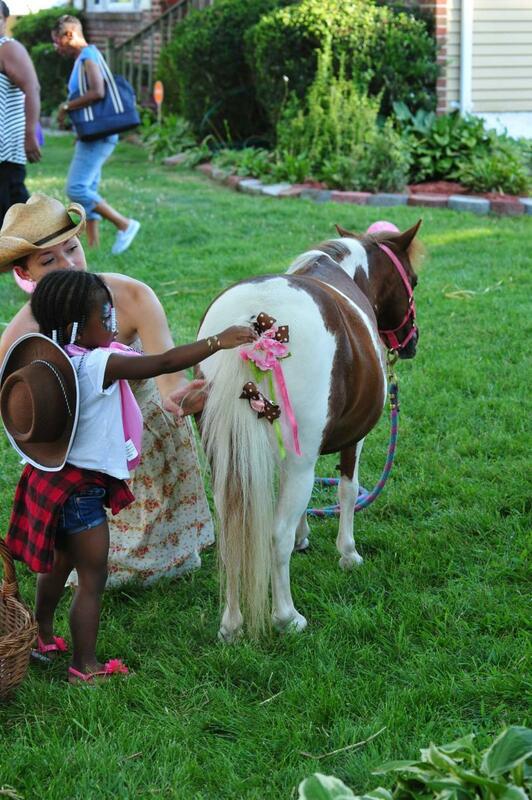 Our parties are meant to be highly interactive between parents and children and ponies. Adults at the party need to keep the children and ponies in their line of sight, and toddlers must be within arm's reach at all times. Generally, your 'second service' goes on at the same time as the pony rides. Our standard party leaves plenty of time for choices, glitter and a few gems. If you are selecting one of our budget options ("lite face painting"), there will be a word board with choices. Deluxe party guests can choose from hundreds of dramatic photos. Standard parties may have a board, or themed painting, i.e. superheros, My Little Pony. 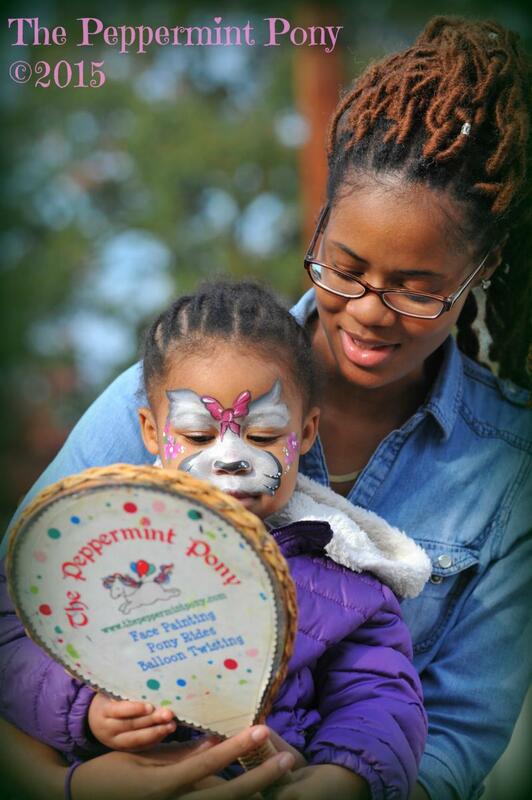 We ask that you not have more than 3-4 children in line for the face painting, as each face will take 3-5 minutes at minimum to paint. If we get static from parents and children insisting on waiting in lines longer than this, we will get our the hand stamps, and request that you put them in groups of 5 or 6, to rotate among our 'stations' - mini horse, pony rides, face painting, etc. We don't want children complaining that they spent the entire party waiting for one activity...and neither do you! EVERYbody loves face painting! I know it is my favorite part of the party. Because we do so many fantasy themed parties, I specialize in wonderful butterflies and fairy masks which I coordinate to the children's clothing. I always keep your party photos in mind. There are plenty of monster masks and flames and gruesome things for the boys as well. Should there be unexpected rain or if you have a swim party, we can substitute glitter tattoos. I have thousands of dollars invested in the very finest and safest cosmetic-safe makeup products available in the world. Because my reputation of safety and professionalism is important, and I do not want to risk my insurance, I ask that you not hire a separate face painter at your event without my approval as a condition of our contract. For the same reason, we cannot paint dirty, obviously ill children, or broken skin. Please have Moms clean their children's faces prior to entering the line. We do not allow screaming and horseplay in the face painting line. Are some kids upset? Please don't fret! Children calm more quickly when pulled out of line to get themselves together and dry their tears. Our face painter is an artist and needs a pleasant work environment to do her best work, so inside voices only please. The horsier kids can continue to interact with the ponies while they wait their turn. You can click on our Face Painting Gallery page for samples of Angela's artistry. Please have your carrots, adults, and camera ready! We will demonstrate our patented technique and then the fun will begin. We expect all guests to supervise their younger children. Please be on hand to help us as the excitement grows one last time before the party's end, with whickers and nickers as the ponies look forward to their well-earned treats. Carrot stubs will be placed on the ground in front of the riding pony. Feel free to assemble your guests for group photos! It will take us about 15 minutes to pack up and the minis are the last to go on so please feel free to take photos during this time. and enjoy the party when the work is done - sometimes we need to boogie to the next birthday bash! Final terms are 'cash and carrots'. Please have final payment ready. Our mission is to delight and amaze you - even our most accomplished hostesses tell us "you were the perfect touch to our party, it was even better than the pictures could say". Tipping a service provider is always acceptable and if we have achieved our mission we will gratefully accept them. My friends in the business and I like to brag on the hospitality of our hosts and hostesses. It's a wonderful thing, that we get to work for such diverse clientele, and enjoy cuisine you just can't get in restaurants. We make feeding us part of your contract, because being able to eat on the road instead of stopping for grub allows us to give each client their desired party start time - we would love to hang out and eat with you but everyone is on the clock and needs to rock and roll! A child giving a final hug to a cherished new pony friend, and perhaps a bit of birthday cake for the hard-working and appreciative ponies and we'll be off! All of our booking is done online. Please browse our Services page for party and pricing info, and then the Reservations page where you scroll down to the feedback form where a menu of party options is listed.